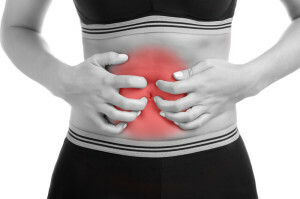 Pain in the stomach is one of the most common problems people experience. The condition is often benign and related to digestion; however, a large number of cases involve more severe problems. Most causes of abdominal pain are not serious, however there are a select number of cases that do require extensive medical care that goes beyond home treatment. Chronic or persistent pain in the abdomen may be caused by a serious problem. While these are some of the most common causes of pain in the stomach, they usually resolve within a few days. The National Institute of Digestive and Kidney Diseases reports that another primary cause of abdominal pain is gallstones. It is estimated that nearly 40 million adults have kidney stones or gallstones, resulting in significant pain that must be treated. There are two types of abdominal pain: acute and chronic. Both are painful for the person afflicted, but are usually caused by different factors. Acute is sudden onset of pain, whereas chronic pain is persistent and continues for days, weeks and even months. Some of the common causes of chronic abdominal pain include Crohn’s disease, reproductive issues in females and pelvic inflammatory disease. The symptoms vary depending on the cause. Some people report a dull achiness in their abdomen that does not go away, while others report intermittent sharp and stabbing pain. ar. If the symptoms are related to menstruation, they may only appear during certain times each month. It is important to report all symptoms to your doctor so that a careful assessment and diagnosis may be made. 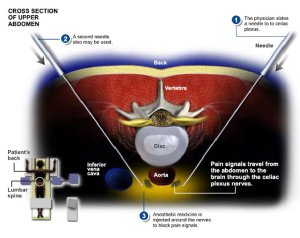 Celiac plexus blocks help 75% of patients for 2 to 4 months. the cause through a series of tests. Diagnosing abdominal usually consists of a thorough physical examination, complete medical history, ultrasound and if needed, a laparoscopy. An ultrasound provides a picture of what is going on in the abdominal cavity or if the female organs are causing the problem. In most cases, ruling out possible causes can lead to the diagnosis of the root problem. Your doctor may ask you a series of questions relating to your symptoms. Some of these questions may involve the duration of time symptoms have been experiences and the type of pain experienced. Do you experience pain after you eat or does the pain exist only at certain times of the day? These are questions to think about prior to your doctor visit. What are the Treatments for Abdominal Pain? Treatment for chronic abdominal pain may be received in a pain clinic where all aspects of the condition can be monitored. Treatment options may include combination therapy with the administration of pain medications and anti-inflammatories, disease medications (in the case of IBD), pain injections (such as Celiac Plexus Block), physical therapy and acupuncture. Physical therapy is useful to decrease immediate pain and provide relief for the patient. Many times the pain keeps the individual awake at night causing further exacerbations of pain during the day, due to a lack of proper resting. Relaxation and behavioral therapy can help reduce symptoms and provide the patient with methods to relax and experience some degree of pain relief. Acupuncture has also become a well-respected treatment alternative for chronic abdominal pain. Acupuncture usually works best when combined with other forms of therapy, such as medication treatment and physical therapy. allow the individual to receive relief. Favorable outcomes should be expected in treating abdominal pain, even if the condition is chronic. Treatment that is effective usually consists of several methods. Combination therapy provides the most effective results, providing significant pain reduction and improved quality of life for the patient. Speak to your pain relief specialist today to see what can be done for your abdominal pain. Help is available and you do not have to live with chronic pain. If you or a loved one lives in the greater Fort Myers area and is suffering from chronic abdominal pain, let Fort Myers pain management help you. The clinic offers the best pain management Fort Myers has. Simply fill out the form on the page or call (239) 288-0072 for assistance and scheduling today!